I Have Psoriasis, Can I Wear Mineral Makeup? Women with psoriasis have been able to enjoy our mineral makeup formulations successfully without further complications. In fact, our mineral cosmetics improved their appearance and created better texture and softness to the skin. In the past, we have had some women with psoriasis wonder if they can actually wear mineral makeup due to it being a powder. The reason for their concern is due to the dry scaly patches they get, and they fear it will make these tiny patches on their skin only look worse. In some cases powdered mineral cosmetics or even standard face powders possessing Talc can and will emphasize dryness on the skin, however a lot of standard makeup brands will also use this ingredient, including liquid formulas. Drying ingredients or problem enhancing ingredients such as Bismuth Oxychloride or Mica based products can make psoriasis appear more scaly. Our mineral makeup formulas have helped women immensely who deal with psoriasis, and have gained the confidence they too can enjoy getting made up and give their skin the appearance of good health. We recognize psoriasis is noncontagious and a very common skin condition that causes rapid skin cell growth which typically results in thickened red, dry patchy areas, which can be a mild case of looking like tiny dry skin areas or get so severe it can cover the entire body in thick red patches. We also know psoriasis is considered non-curable and can be long term and chronic and in some cases it can go into remission for years only returning later for no known reason. Our hearts go out to those that suffer from this frustrating skin malady. Since this condition worsens in dry winter months, a very good moisturizer is imperative and many report it improves in the warmer summer months when typically our humidity is higher. Sunlight exposure is also noted to improve this skin condition. But mineral makeup does not have to be a hindrance and depending on the severity of your psoriasis, you can have success with using our mineral cosmetics. Our combination of mineral makeup ingredients of Zinc Oxide, Rice Powder, Allantoin and Jojoba Oil are what make our products perform so well on faces which can have patches of psoriasis. All of these ingredients have soothing properties including Jojoba Oil which is known for normalizing the pH balance of skin while Rice Powder is soothing and non drying. This makes our ingredient profile excellent for softening skin, whereby improving it's overall appearance. 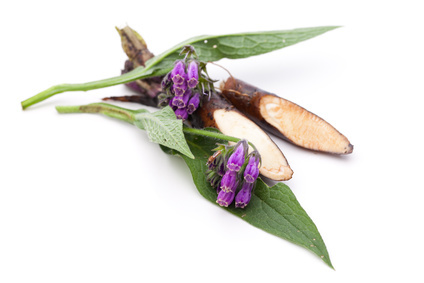 Allantoin is a botanical extract from the Comfrey plant and the FDA has classified this ingredient as a safe and effective skin protectant against rosacea flare-ups, chapped, chafed, cracked, acne prone and sunburned skin. It is used for it's skin soothing properties. It is known to produce rapid cell turnover (skin cell proliferation) by removal of necrotic tissue which can improve the texture and appearance of skin. Allantoin is used especially for its soothing properties for acne and rosacea. We can only surmise with this ingredient profile and through testimonials of customers, it is why we have had success in women which do have psoriasis on their face, begin seeing improvement in texture, softness and are able to achieve nice coverage for reducing the redness which can be associated with this malady. Samples are offered to try before committing to full size products to see if our minerals will work for you. For this type of skin condition we recommend our Delicate Rose Petal Foundation. You may also enjoy using our ONATI Skin Care regimen for further compliment in keeping skin soft and moisturized when using our mineral makeup products.